This week we have here some usual suspects but as well some positionals that we do not see here very often. Plus we have one dwarf living the elf dream. First of the 2 rookie Dark Elfs in this leaderboard this week. 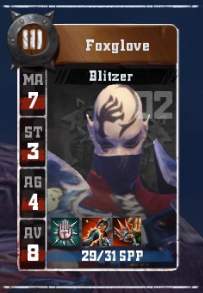 Foxglove is raising star of the Dark Elf team as he rolled double on his first level up and is now blowing mightily. 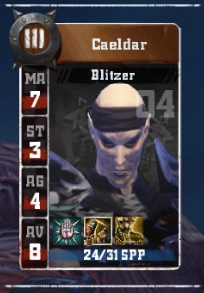 That skill has proven to be very effective in the game agaist Elf Union team where in 11 blocks he broke the armor 5 times and injured 2 of the Pro Elfs. Additionally he caught 2 passes and scored a touchdown. For his efforts he was rewarded by leveling up and rolling another double. Division 8F has now POMB Dark Elf running around. So get you fouling boots ready and in top shape. Foxglove yearns for some stomping. 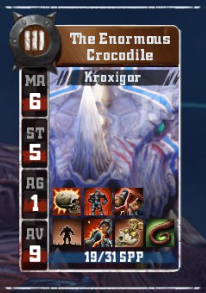 Kroxigor is the kind of positional that you do not see in this leadeboard. As far as I know this is the very first Kroxigor that made it here. But since my memory has more holes in it than my defense formation it does not mean much. Quiguanas was rather hungry after blood in that match. He made 12 blocks and broke armor 7 times. Resulting in 1 knockout and 3 casualties. They were all Bandly Hurts though which is huge shame as they were dirty rats. They are even called All Rats must DIE so even their coach must have been dissapointed in that. There was another thing in the match that you do not see Kroxigor to do very often. He made an interception. Even that remarkable achievement did not save the team from a loss. Caeldar is the highest ranking player from the fresh divisions this week. He does not seem to be fond of the emo bunch that is his team and his dream is to become War Dancer. He made an inportant step towards that goal in his last match where he broke armor 3 times in 7 blocks. 1 break resulted in knockout and 2 breaks in badly hurt. Fantastic removal rate. He as well scored both touchdowns of the game and ensured the team won their first game of the season. In the end he made his dream true and after leveling up he took Leap. Now everyone will have to suffer watching that terrible leap Dark Elf Blitzer animation. When I saw this report I had a strong WTF (Wow That's Fantastic) moment. I was looking at 4-0 result which by itself is quite something. Then I saw the team that scored 4 pieces was Dwarfs. And if that was not enough Mr. Run For It scored all of them. 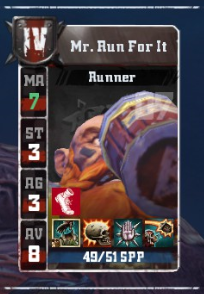 Nuffle likes to go either along or against the team/player theme so it was only appropriate Mr.Run For It has movement stat up, while playing for Buff Men With SHORT legs. With the Kick Off Return it is almost no surpise this beast can score so many touchdowns in such short time. And he was not too shaby in the blocking department either. All 3 of his blocks resulted in armor breaks and 1 in knock out. He carried the ball unbelievable 126 meters, which translates to 62 squares. This is what Dwarf team can do with 2 Blitzes and 1 Perfect Defense. Poor Lizardmen. Spike III is not a newbie in this section. Just 3 weeks back he was 5th in the leaderboard and someone spiked his drink again and he went crazy once more. 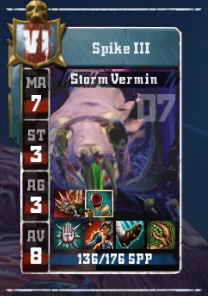 Last time I was surprised that just one season Skaven team was able to build level 6 killer. Apparently Spike III was transferred fom retired REL team The Saskatoon Shiners this season. And it was certainly good deal. The team is doing quite well being 4th with 2-2-1 record and Spike has had a huge part in it. The latest game ended in a tie and Spike broke armor 16 time in 14 blocks - obviously the benefits of Piling On - knocked out 3 players and injured another 4. He was on fire and unfortunately it was not fire caused by a fireball. One of the injuries was straight dead killer Beastman with Mighty Blow, Tackle and Block, which must have made rest of the division quite happy. On top of that one Guard Beastman and Blodge Warrior will miss their next game thanks to him. Last week I was joking that I hope that Razta's unpronouncable players won't make this leaderboard. Razta clearly wants to show me as his effor brought Idhrenmaedhdraug MTL on the 3rd place for next week so far. Are we gonna see him here or is that 15 points not going to be enough? Tune in next week.